The team at Romanelli Cosmetic Surgery is happy to welcome Dr. Christine Blaine to its Long Island plastic surgery practice. In addition to cosmetic and reconstructive surgery, Dr. Blaine has a strong background in biopsychology and trauma care. Romanelli Cosmetic Surgery, a Long Island plastic surgery practice, is proud to announce the addition of Dr. Christine Blaine. Dr. Blaine is a plastic surgeon who specializes in liposuction, labiaplasty, BOTOX® Cosmetic, dermal fillers and breast augmentation on Long Island. "Being a native New Yorker, I feel very fortunate to be able to join Romanelli Cosmetic Surgery right here in Huntington," Dr. Blaine says. "I am honored to work with accomplished, board-certified plastic surgeons Dr. James Romanelli and Dr. Dana Khuthaila. I look forward to learning from their extensive knowledge and contributing my own unique abilities to the practice." 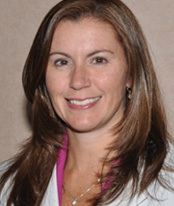 Dr. Blaine began her medical journey by earning a bachelor's degree in psychobiology from Binghamton University while working as an emergency medical technician and instructor. There she formed an appreciation for the psychological and emotional facets of patient care and developed her strong belief in treating not only the body but the individual as a whole. She carried that philosophy with her through her subsequent medical training and her work as a physician assistant at various hospitals, including Memorial Sloan-Kettering Cancer Center, where she cared for post-operative plastic surgery patients. "My experiences, from my time as an EMT to my position as a physician assistant at Sloan-Kettering, reinforced my holistic approach to patient care," Dr. Blaine says. "I've learned that it's important to incorporate people's physical and emotional needs into a treatment plan." After receiving her master's degree in education from State University of New York at Cortland, she completed her medical degree at Albany Medical College. She was chief resident of plastic and reconstructive surgery at Lehigh Valley Health Network in Allentown, Penn., before joining Romanelli Cosmetic Surgery as the third plastic surgeon in the New York City-area practice. Dr. Blaine has been involved in research throughout her medical training, and she continues to study factors that affect patients' decisions regarding breast reconstruction following mastectomies. "We are thrilled to have Christine joining us, and we are enthusiastic about everything she will contribute to our practice," Dr. Romanelli says. "Through both her treatment philosophy and her ongoing research, she demonstrates a dedication to providing the best care for patients. She is truly an asset to Romanelli Cosmetic Surgery." Dr. James Romanelli and his team of plastic surgeons at Romanelli Cosmetic Surgery (http://www.jrcs.com) specialize in body, face and breast enhancement procedures. After earning his medical degree from SUNY Downstate, Dr. Romanelli undertook 8 years of post-graduate specialty training in general surgery, plastic surgery and hand surgery. Dr. Romanelli has received numerous awards and professional appointments in recognition of his surgical skill. He serves as Chief of Staff at Huntington Hospital in addition to providing a full range of procedures through his cosmetic surgery practice, where he is joined by Dr. Dana Khuthaila and Dr. Christine Blaine. James N. Romanelli, M.D., F.A.C.S. Long Island, New York, Plastic Surgery Center Welcomes New SurgeonDr. Christine Blaine, plastic surgeon and breast augmentation specialist on Long Island, New York, joins Dr. James Romanelli and Dr. Dana Khuthaila at Romanelli Cosmetic Surgery.